Dept. of Funding: I’ve been meaning to post this as it’s a good project. 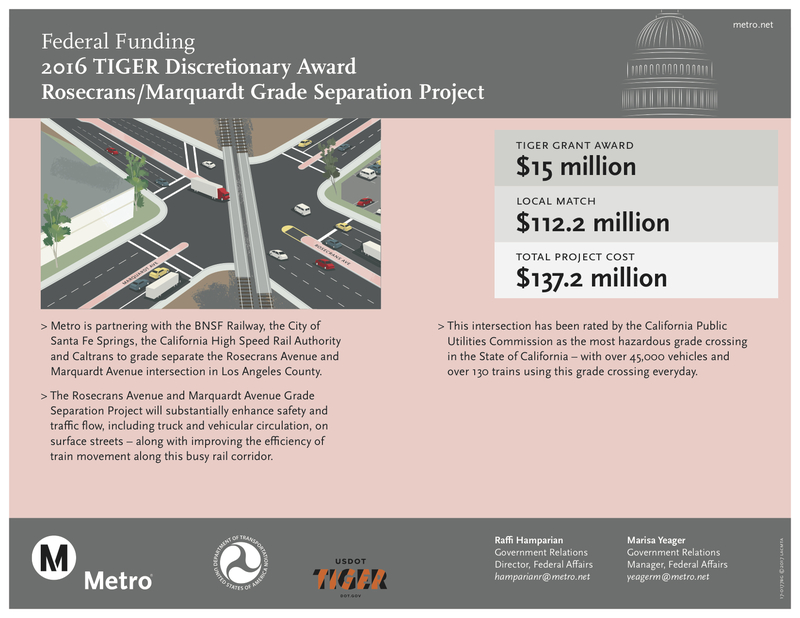 Metro has done pretty well with the federal TIGER grants over the years. One reason: L.A. County has local money via our three existing sales taxes. Those dollars attract federal dollars. Metro is running extra Expo Line service to Rams games at the Coliseum. Details here. The Rams host the Chiefs at 6 p.m. Saturday. Union Station Reminder: there is a safety exercise Wednesday morning at Union Station. No impacts to transit service at the station but the front doors closest to Alameda will be closed in the morning — enter through the South Patio (there will be staff and signs to help). Details here. Actually, the story doesn’t quite go that far. But the story does a good job summarizing a few smallish deals around the U.S. in which transit agencies are helping subsidize ride hailing companies on routes where bus service suffered from high expense and/or low ridership. My three cents: I think there may be room for these type of deals in areas where bus service doesn’t have a great track record. But I don’t think ride hailing is much of a substitute for very frequent buses running on busy corridors. Who knows…maybe ride hailing versus transit is a lot like Batman versus Superman. A misunderstanding and then a common mission. The bike share system used by Santa Monica extends to adjacent Venice. Makes sense. Venice and SaMo are connected by the beach bike path and Main Street, as well as some residential streets (albeit with some uphill). Based on the number of venues that already exist and an expanding transit system, the Curbed post goes further than the headline and concludes that L.A. probably should win the 2024 Summer Olympics. But here’s a thought: How about simultaneously granting a city the Olympics twice, once now and again 12 years later? That would allow the host city to enjoy the economic benefits of the Games twice, effectively bringing in double the revenue and amortizing the infrastructure costs over two events. The article includes a pic of the Expo Line and some insight about who is trolling for the Games on behalf of L.A. The International Olympic Committee will make a decision in Sept. 2017 to give the ’24 Games to either L.A., Paris, Rome or Budapest. The Alameda-Contra Costa Transit District (AC Transit) officials said the free app, called “TipNow-AC Transit,” allows riders to be “an extra set of onboard eyes and ears helping to promote rider safety and system security.” Riders can choose between a number of icons, including “disruptive behavior,” “theft,” “suspicious activity,” “vandalism” and “unattended package,” to anonymously file reports. Critics say such apps are creating an easy way for users to racially profile other transit riders. Of course, Metro already has its own Transit Watch app, which has been around for a while now — and without controversy, as far as I know. The complaints we’ve received have all been along the lines of ease of use (or lack thereof) and response time. There has been no shortage of bad news about the damage inflicted to coral reefs by climate change and other environmental woes. Well, here’s some good news. In one protected area in the Pacific, the coral seems to be bouncing back. Scientists are trying to understand why. Two hypotheses: algae is adapting to warmer waters and perhaps new fishing restrictions are helping. Climate change got you down? Good! It should! Wanna do something about it? Try taking transit every so often. As we’ve noted before, generally speaking taking transit results in a lower carbon footprint than driving alone. On the bad news side, National Geographic has time-lapse video of coral bleaching in action (not pretty) and another story about global warming’s impact on the Great Barrier Reef in Australia. Warning: mild adult content. If you’ve made it this far in this post, you’ve probably encountered this story already on social media. Things to read if you’ve got nothing else to read: some gold medal attempts at frequent commenting in the subway lawsuit post from the other day. Go Metro and meet Olympian gold medalist at Valerie Brisco at 7th/Metro today! $137 million for a crossing is an insane amount of money. This doesn’t seem like the best allocation of resources. The budget for Expo Phase 2 was around $1.5 billion. Is a crossing really worth 9% of a whole line extension?